War Eagle Extra has moved! Just got off a teleconference with Auburn draftees Trent Mummey and Hunter Morris. While that was going on, left-handed pitcher Cole Nelson got taken by the Detroit Tigers in the 10th round with the 313th overall pick. And left-hander Grant Dayton just went to the Florida Marlins in the 11th round with the 347th overall pick. Brian Fletcher and Kevin Patterson are still waiting. Both should go sometime today. "Yeah. I was kind of expecting around that round. I was a little surprised at the team that took me. I haven't really talked to them much, so it was exciting they took me." "You always dream about playing professional baseball. And this is just one step closer to fulfilling my dream. As a little kid, you grow up watching Major League Baseball and watching all those pro guys play. And you go out in your backyard and dream of being one of those guys. And it's just exciting to have that opportunity. And I'm just ready to hopefully take that step forward and join a bunch of other great Auburn players who have played in the big leagues." "I was actually watching it online with MLB network. And I was sitting there huddled around the computer with my family at my house and my named popped up and it was a really exciting moment for me and my family. We're all really excited about it. And then about five or 10 minutes after I was drafted, the area scout for the Orioles called me and congratulated me and told me that they would be in touch with me after the draft. So I guess it's a busy time for them right now. But I guess once the draft process is over they'll get in touch with me about all the negotiations and stuff." "After the loss last night, I 've never really had that feeling before in an Auburn uniform. After every year the season has ended it's just always been a disappointment that we didn't make it to the postseason. And after last night, when we lost in front of all our fans, it was really hard to take the Auburn jersey off. We had a lot of expectations this year and we wanted to go out a little further. I twas certainly upsetting last night that we lost. But I really feel like it was a great group of guys that we had on the team who really brought out the Auburn family for baseball. 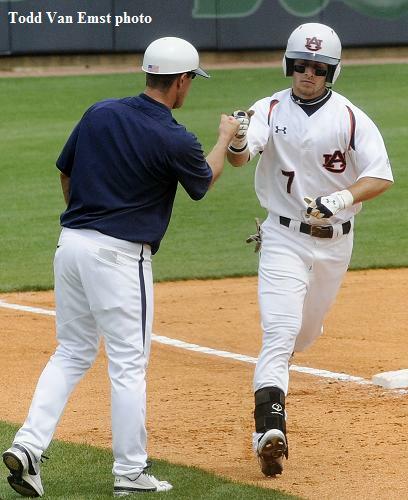 It was probably one of the most exciting times for Auburn baseball. As many games as I've played in that stadium, these last couple games were really great. It was just really special to get to experience that before the season ended. 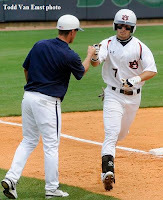 So I feel like we brought back a winning tradition to the Auburn baseball program." "Every part of baseball is a funny thing. No, I'm not surprised. I've been through the process before, having gone out of high school. I definitely had high hopes that it would have happened earlier, but I'm in a good situation with a great organization with the Brewers. It's an exciting opportunity. I'm looking forward to seeing what the future has in store." "Yeah, they had a lot of interest out of high school. I had a lot of good conversations with them this year. I knew they were in the mix. I knew there were a few teams that had some high interest, and they were definitely one of them, so it wasn't really a surprise to me that they were the ones that stepped forward and took me there." "That's very exciting. I would like to do everything I can to not spend much time in Huntsville and be in Milwaukee as fast as possible, but yeah, I think I can bring a lot to that part of the organization. A lot of people in Huntsville have been following me and my career for a while now, and it'll be exciting to be back and play in front of those fans here hopefully in the next year or so." "I was actually driving to my apartment and I was on the phone with my dad. We were kind of sitting there with raised eyebrows, just saying, 'What's going on?' And then all of a sudden he said, 'Congratulations.' I was like, 'What are you talking about?' And he told me that I just got drafted by the Brewers. So we were obviously excited and very relieved for it to be over with. It's behind us now. And it's time to get out and play and continue my baseball career." "You look at the last three years, the trials and tribulations that this team and this group of guys has been put through, for us to finish the way that we did, having such a great year, has had a huge impact on my life. The way that it was such a tight-knit group of guys who have been here, been through the struggles, for us to be able to put that kind of season together, it was so exciting. I've been more pleased with the way things ended up. Obviously I wish we were still playing. But the way that the season shaped up was absolutely incredible." How many SEC games will the Auburn men's basketball team win next year? 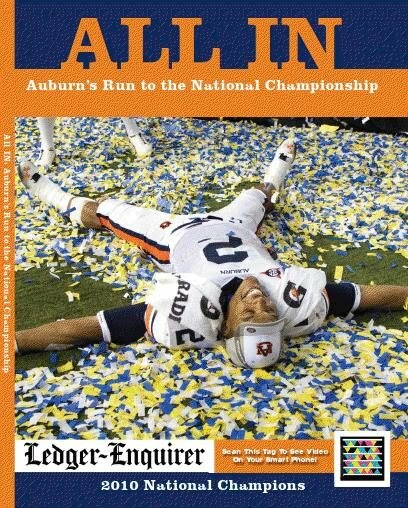 Buy our book: "All In: Auburn's Run for the National Championship"
The Ledger-Enquirer has put out a commemorative book on the Tigers' BCS championship season titled: "All In: Auburn's Run for the National Championship." 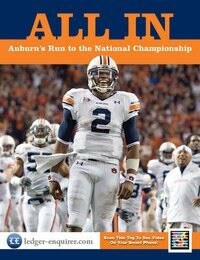 The 160-page soft cover book has my articles about the Tigers from the start of the season. It is a normal magazine size with color pages and will be printed on picture book stock. You can purchase one online here. It's only $19.95 (plus shipping and handling). You can also call 1-888-600-7816 or 1-888-806-0918 to order. 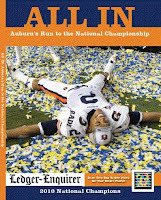 Auburn beat writer for the Columbus (Ga.) Ledger-Enquirer. Got a question about Auburn athletics you'd like answered? A comment you'd like to see published? E-mail me at abitter@ledger-enquirer.com. Be a fan of the blog on Facebook.